Two young British sailors are undertaking an ocean-sized challenge by sailing dinghies round Britain this summer. Chris Brooks, 25 (above), will be attempting to go round in 28 days or under in an F18 catamaran in June, while 21-year-old Ludo Bennett-Jones leaves this weekend to sail round Britain in 50 stops in a 16ft Wayfarer dinghy. Chris Brooks says the idea has been in his mind for several years. He originally planned to sail round with his friend Glen Foster. But in February last year, the 33ft yacht they were delivering from the UK to Portugal was overturned by a wave on the approach to Povoa de Varzim near Porto and Glen and fellow crewman Chris Hull were drowned. Brooks’s new F18 cat has been widened by 2ft to increase the righting moment and he has fitted a furling headsail and equipped the boat with a self-righting mechanism should he capsize. His voyage which will be between 1,400 and 1,800 miles depending on stops, will take him from the Solent round the north of Scotland through the Pentland Firth. By doing stages of 80 or 90 miles a day he hopes to better the time of 28 days set by two young sailors in 2006 in a similar small catamaran. It will be a strenuous feat for Brooks, as the F18 is a high-performance twin-trapeze boat. However, in the right conditions he says he could tot up some longer daily passages. Beating him to the off this weekend will be Ludo Bennett-Jones (pictured below right), who will be leaving from Cowes to sail clockwise round Britain. He, too, aims to sail right round the top of Scotland and to stop off in the Isle of Man and Northern Ireland on the way. Like Chris Brooks, Ludo Bennett-Jones won’t have a support boat, but will be shadowed by friends on land. And he, too, will be doing it for charity. 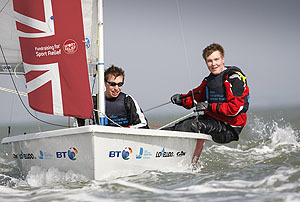 His goal is to reach £100,000 for Sports Relief and the Ellen MacArthur Cancer Trust.